Luminara™ candles display a dancing, flickering flame so realistic that even at a distance of a few feet, it is all but indistinguishable from a naked flame. Our top-of-the-range Luminara candles from Smart Candle use electromagnetic technology to create the realistic illusion of a dancing flame. The constant movement of the Luminara virtual flame is soothing, almost mesmerizing to young and old alike. The illusion of natural, flickering flame is perfect, and delivers all of the homey aura usually associated with naked-flame candles. The dancing flame is achieved using a combination of electromagnetics and highly focused LED lights. These elegant and strikingly realistic candles make wonderful centre pieces for your table or fireplace. Additionally they add the ambiance of candlelight to places traditional candles cannot go. On /Off and Timer switch option 5 Hours on, 19 Hours off. 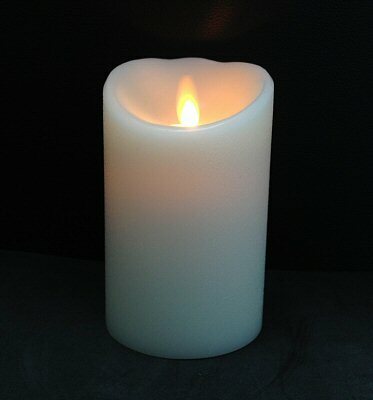 In our opinion, these are the best real-wax electric candles available, and are designed for everyday, casual use, at a very affordable price. These candles are great fun! Place them together or as a group without fear of soot or other marking. The standard easily-available batteries (included) are already fitted. All you do is press down on the candle body to switch on and marvel. Smart Candle technology uses intelligent electronics and LED’s to generate a long-lasting, realistic light that perfectly simulates a wax or liquid-fuel candle flame. Every Smart Candle creates a stress-free way to experience and enjoy an inviting, ambient light. Being lit using LED technology, which is a non-heat generating form of light, these candles pose no fire risk. The candles are clean, maintenance free and create no smoke or soot. They will also not blow out in the wind. LUMINARA by Smart Candle uses intelligent electronics and LEDs to generate a long-lasting, random, flickering light that perfectly simulates a wax candle flame. Smart Safety Eliminates risk of Candle-related fires caused by unattended open flames, hot wax, heat and flammable materials. The flameless Smart Candle product completely eliminates accidents associated with candles. Smart Candle is safe for both indoor and outdoor use and may be used with materials such as paper, wood, plastic, dried flowers, and even fabric. Versatile With its long-lasting, wind-proof ambient light, Smart Candles can be used everywhere. Indoor: bedroom, bathroom, dinner parties, Outdoor: patio, decks, garden, luminaries, camping, boating, Commercial: restaurants, hotels, spas, churches, banquet halls, care facilities, Seasonal: holidays gatherings, decorations, window treatments, Safety: emergencies, power outages, doorways, walkways, nightlights.